The students of Annapolis High School in Dearborn Heights created SHEWS (Students Helping End World Suffering) because they want to help people beyond their borders. In this spirit, they have selected water as their focus. The students raise funds yearly in order to support the construction or refurbishment of wells in areas of Africa in particular need, with a special focus on areas with children and schools. 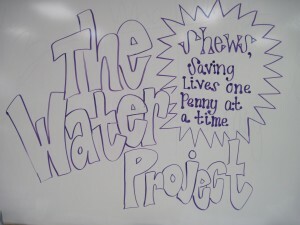 The students want to help end world suffering in whatever way they can, and The Water Project is it. Please show your support of the efforts of the students at Annapolis, as well as for the children in Africa who are in dire need of assistance, and donate to the cause. SHEWS appreciates your support! 03/28/14 Heidi Kutzley $25.00 Great job AHS! We are lucky to have such great kids and an awesome, motivated sponsor like Mrs. Fynan!! 03/19/14 Joy McDonald $10.00 Am very happy to support such a worthy cause!